Determined to come to terms with painful childhood memories, disappointing personal decisions and secrets that threaten to undermine her future, Liz Kroft decides to embark on a journey of self-rediscovery hiking the John Muir Trail. Meant to be a three-week, solitary journey of introspection, her plans unexpectedly change when her boyfriend Dante decides to join her at the last minute. As the trek unfolds, Liz is forced to take ownership of her past actions and face up to her deepest secrets and fears, all the while dealing with the demanding hike, majestic but daunting landscape, inclement weather, as well as some unsavoury characters. It’s true that The Middle of Something is the eloquently told tale of one woman’s journey in search of clarity, repentance, acceptance and forgiveness, but don’t let the book’s blurb fool you. Within the pages of this wonderfully written book, Sonja Yoerg has artfully and skillfully crafted a fast paced, heart pumping adventure tale that will not only pull at your heart strings but get your adrenaline pumping too. Not only did this unexpected twist add a level of complexity to an already great story line, but increased the enjoyment of the book as a whole. The scenery and landscape of the John Muir trail are captured so vividly that I wish I were a hiker. I was so captivated by the majestic beauty described that I would love to go on this journey myself! The characters are engaging and true to life, their emotions, dialogues, interactions and mannerisms so realistically rendered that you can’t help but get emotionally attached to them. As much as Sonja Yoerg has created Liz, Dante, Paul and Linda to be personable and likable, the Roots brothers were created perfectly evil and add just the right amount of danger and excitement. 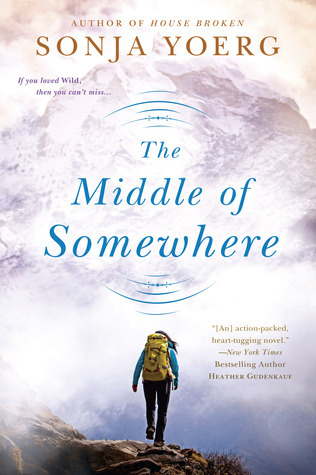 The Middle of Somewhere was such a wonderfully surprising read, very satisfying and entertaining. I thoroughly enjoyed it and recommend it to fans of women’s fiction and thrillers alike. You should all definitely get your hands on a copy of this great read and while you’re at it, check out Sonja Yoerg’s debut novel House Broken. Thank you to NetGalley and Penguin Group (Berkley)/NAL for providing me an advanced reader copy in exchange for an honest review. < Previous The Goodreads Seasonal Reading Challenge is about to start!